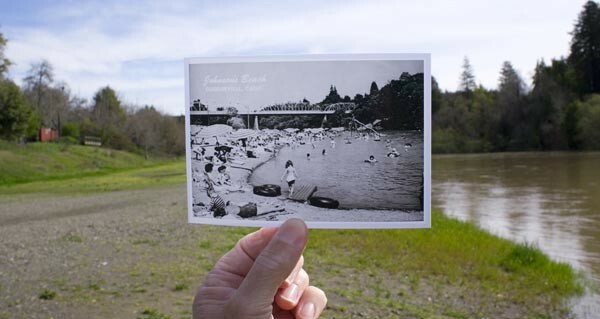 Framed by the historic Guerneville Bridge at the heart of the Russian River resort area, Johnson's Beach and campground have been on old-fashioned family tradition under the redwoods since the early 1920s. Gertrude "Gertie" Johnson and her husband, Ernie, opened the long stretch of beach as a public swimming spot in the middle of town circa 1921. At one time owned by the Rounds family, brothers Clare and Herb Harris bought the property in 1967. Guerneville natives since 1918, the Harris family also owned the famous Rio Nido Dancehall and Resort. "In those days, you didn't go in the river before Memorial Day, because nobody had a chance to find out what the floods had done," says Marion Ridenhour, a fifth-generation resident who spent summers during WWII as the Johnson's Beach lifeguard. It was an era when it cost a dime to jump on Captain "Biddy" Green's water boat as it taxied between Monte Rio and Guerneville. "We had canvas canoes. The first thing we did when we opened in the summer was spend a week patching and mending them," Ridenhour says, recalling how the U.S. Army's 17th Infantry men would haul cases of Acme beer down to the beach, letting them cool in the river. Today, Johnson's Beach is open mid-May through September, weather permitting, and, fortunately, the canoes are now aluminum. As for beer, big cups of Red Hook are available for just three bucks at the snack bar, where prices have hovered refreshingly low across the menu. The legacy of summer concerts at Johnson's Beach has kept thousands of patrons coming every year since the 1940s. 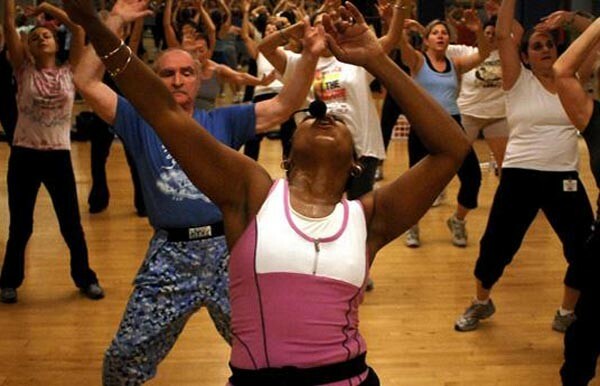 This year's 36th annual Russian River Jazz & Blues Festival returns in September, and the 23rd annual Vineman Triathlon is in July. The Harrises hope to run Johnson's Beach for generations to come. "I am only the manager," says Laura Harris-Wilson, who co-manages the beach with her husband, Willy. "Johnson's Beach keeps going with the hard work of the entire family—my Uncle Clare and his wife, Carla, my five sisters, our children, my three cousins and their children. We are proud to be an old fashioned, family-owned and -operated business." Under the shade of a vintage beach umbrella, you can still hear Clare Harris hollering from the snack bar as "outta towners" fumble with bulky canoe paddles, struggling to make headway as one person paddles forward and the other paddles back. There may be a world-class museum now across the street, and the Warm Puppy Cafe may have gotten a facelift over the years, but walking into the Redwood Empire Ice Arena, aka Snoopy's Home Ice, is like walking into the styles and colors of 1969. Virtually nothing has changed around the ice rink: the faux-Swiss chalet building facades wrapping the walls; the giant brown cuckoo-style clock; the flags of many nations; the wood panels everywhere; the red light-up Coca-Cola sign marking "Couples Only," "Ladies Only," "Reverse" and "Clear Ice." Resplendent with the washed-out colors so coveted in "retro" photography, the arena is one of the few places where, other than teenage fashion on the rink and Adele on the PA, time has truly stood still. 1667 W. Steele Lane, Santa Rosa. 707.546.4147.—G.M. What do golf, Ronald Reagan, the Moonies and the golden age of Hollywood have in common? If you answered Pope Valley's Aetna Springs Resort, which opened in 1873, you obviously know your Napa history. Following the Civil War, a Pope Valley quicksilver mine dug itself into disaster when miners hit a hot-water spring that halted the operation—and just like that, Aetna Springs was born. A golf course soon followed in 1893; today, it's dubbed one of the oldest west of the Mississippi. Aetna Springs eventually became the go-to spot for Bay Area socialites and Hollywood celebrities. Ronald Reagan was so taken with the resort that he announced his candidacy for governor there. Aetna Springs has morphed many times since—some would say to its detriment in the '70s, when the religious movement nicknamed the Moonies took ownership. But those memories are often dwarfed by the resort's glory days of the 1920s, when famed filmmaker Frances Marion made it her respite. (Marion's father, Len D. Owens, was the original owner.) Today, Aetna Springs embarks upon another awakening. Owner-developers Robert Radovan and Bill Criswell purchased the resort in 2006 and are on track for restoring the property. Completion is slated for 2015. Here's hoping this rebirth sends the Aetna Springs image back to the glory days of its youth. Aetna Springs Road, Pope Valley.—C.J. Monroe Hall, Santa Rosa's hardwood-floor dance hall piously crowned with a fluttering American flag, is mostly associated with line-dancing and jazzercise these days. But according to local newspaper reports, its 1922 origins were slightly more subversive. The then-clubhouse was born when a local women's group, which had been meeting for several years beforehand, insisted on a permanent space. After buying a plot of land for $10, the determined stitch-and-bitchers borrowed $4,000 for the building with their husbands' co-sign, since women couldn't lawfully borrow money in the early '20s. The hall is famous for helping form the Saucy Squares Dance Club. The now-nonprofit square-dancing collective was founded in 1962, when Joe Paul, a welder from Sebastopol, called the do-se-dos. Paul could often be found swinging his partner and playing his banjo as part of Monroe's Circles and Squares, before eventually forming the West County group. The hall, now decorated with antique axes and old farming tools, offers Scottish country dancing, African dance, California ballroom, square dance and a good old-fashioned '80s heap of jazzercise. 1400 W. College Ave., Santa Rosa. 707.539.5507.—R.D. Where else does the sound of laughing children mingle naturally with the soft splash of jumping fish or the occasional cry of a passing raptor? Casini Ranch, a family-oriented (and -operated) campground and RV park, has offered this accessible outdoor experience since 1965. Tucked into a bend of the lower Russian River just north of Duncans Mills, the ranch offers a mix of individual and group campsites, platform tents, and even a few cabins, spread over 110 acres bounded by a mile of riverfront. Timeless activities, such as hayrides and bonfires, are offered regularly during the summer months, along with more modern diversions like an arcade room, cable television connections and Wi-Fi. In short, it's a place where human recreation coexists comfortably with native wildlife—if you don't count the river otters' occasional unwelcome raids on the Casini trout pond. 22855 Moscow Road, Duncans Mills. 707.865.2255.—B.R. It's hard to believe that posh Tiburon was ever known as a Navy fueling station frequented by hard-working and hard-drinking sailors and railroad workers. At 92 years and counting, Sam's Anchor Cafe remains the best reminder of the days before real estate values skyrocketed and local demographics followed suit. During Prohibition in the 1920s, the seaside port aided namesake Sam Vella, who was reportedly running moonshine to San Francisco through a secret trapdoor inside the restaurant. These days, Sam's is known as a stellar seafood restaurant. But it's also party central for Opening Day on the Bay, marking the beginning of yachting and boating season, in which hundreds of young locals gather at Sam's for a sun-drenched celebration. On the big day, of course, the most desired spot is actually on one of the boats, provided you can get on one of them. Hey bro, didn't you say your sister knows a guy who knows a guy? 27 Main St., Tiburon. 415.435.4527.—D.S. "Where's the old guy who knows everything?" The request is not uncommon at shops that have been around for a long time, and especially so at the Bike Peddler, where serviceman Abe Driedger has been adjusting cables, fitting freewheels, assembling forks and replacing brake pads behind the counter since 1976. Numerous times I've come to Driedger with some impossible request—say, a replacement part on a derailer from a late-'60s Motobecane—and he'll scour his boxes to come up with the right thing. With decades of knowledge and a collection of just as many weird, proprietary tools, he's something of a 10-speed guru, helping the Bike Peddler win your Honorable Mention vote for Best Bike Shop in Sonoma County. Just don't be too quick to call him "the old guy" until you've seen him whizzing around on blades of steel with his second love, ice hockey. 353 College Ave., Santa Rosa. 707.573.0112.—G.M.